Cool Soccer balls come in all different colors, sizes, and yes shapes (more on that later). Someone once said, “you can’t play ball without a ball…”, so today we get into what we consider some of the coolest balls on the planet. We are not going just on design, but more on functionality. Since there are so many cool soccer ball designs, it would take years to find the coolest soccer ball designs. Nike alone brings out about 200 different designs every year, well you get the point. I’ve compiled a list of some of the coolest soccer balls known to mankind as of today. 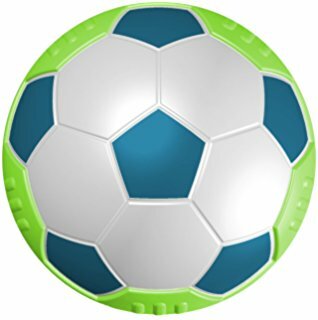 By Cool Soccer balls we are talking about a soccer ball that goes above and beyond your regular soccer ball. Not only do these cool soccer balls bring about joy through games, but they are also a little different than your normal regular soccer balls. They are randomly ordered, so we don’t prefer one over the other and this is not a review of the coolest soccer balls ever, but rather for informational purposes. 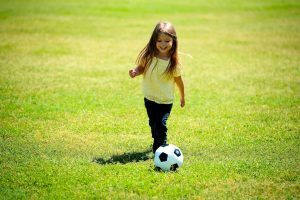 Sometimes parents or friends of soccer loving players want to purchase a cool soccer ball that is different than what that player may already have at home. Ok remember we said earlier that the cool soccer balls come in different shapes…. Well this is the reason. Usually all of the cool soccer balls are round… except this little cool soccer ball, the hover ball. This is actually half of a soccer ball, with a plastic bottom to help it glide on the floor. 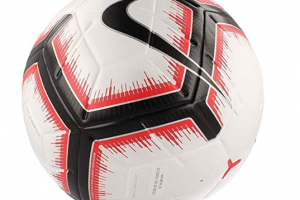 Although it’s a super cool soccer ball… it does not “hover” so don’t get your hopes up. It does “glide” on the floor and it won’t scratch the wood floors so don’t worry. It also glides on the carpet. It’s a cool little soccer ball to have around if you don’t want your kids bouncing balls in the house. AND it can also help with ball control. 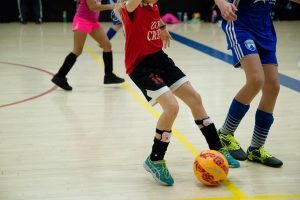 Our kids use this cool little soccer ball in the home and practice controlling the ball with the sole of their foot, something that is used very effectively in futsal.You can also play a small sided game of soccer with the hover ball. 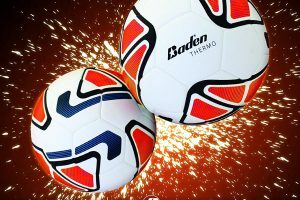 So for the low price and its purpose, the hover ball is definitely a cool soccer ball and now you know why it made our list of cool soccer balls! The glow in the dark soccer ball is one of the coolest soccer balls ever. 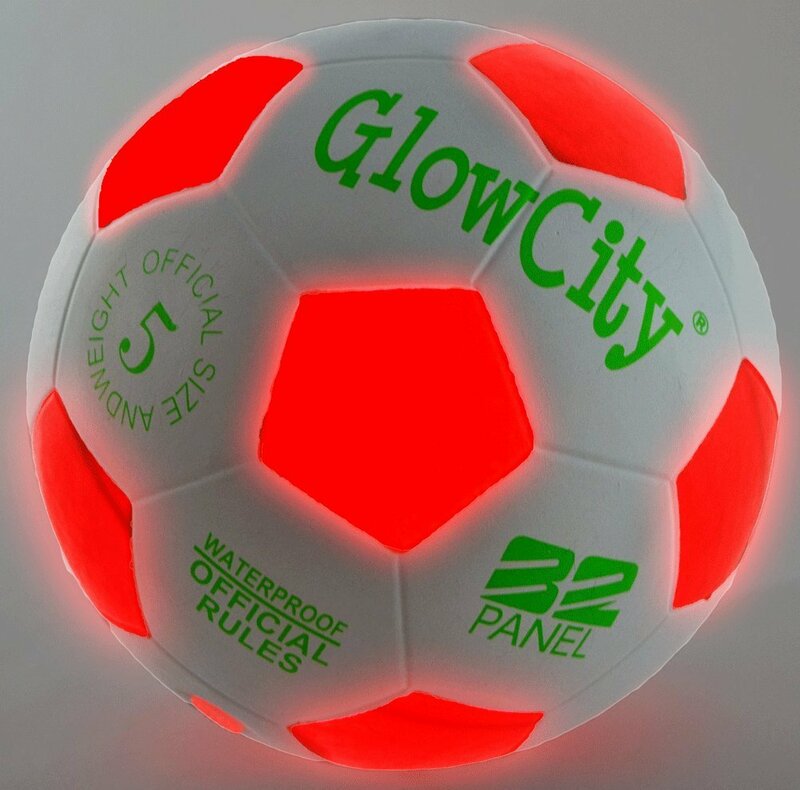 Who doesn’t love a glow in the dark soccer ball? Even non soccer players will think the glow in the dark soccer ball is cool. These Light Up LED Soccer Ball Black Limited Edition Glow in the dark soccer balls are quite technologically advanced. The led lights are impact activated and stay on while playing the game. So it’s not just a ball that glows, these are lights which are powered by two Hi Bright LED’s that are a nice fit inside the soccer ball. Some balls are “Impact Activated” which allows it to stay lit while playing, no On & Off Switch to break! Yes you can play with it at night and the cool soccer ball will glow, but remember that it must be played in the dark. 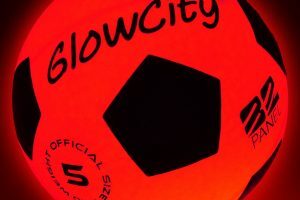 So even though you won’t be able to see where the goals are, or your teammates, or even the pitch, you can still kick around a nice cool Light Up LED Soccer Ball Black Limited Edition glow in the dark soccer ball. Ideally it’s used more for just pick up games in your backyard. Or maybe just hanging out with friends and doing some juggling or dribblig. It’s obviously unsafe to play in complete darkness, but an actual soccer ball that lights up is a really cool invention and we can all agree it should be on the list of cool soccer balls. Below are two of my favorite. Ok, We wish this one had been around when we were kids. This cool soccer ball is made by Baden and you get to create your own drawings on it! 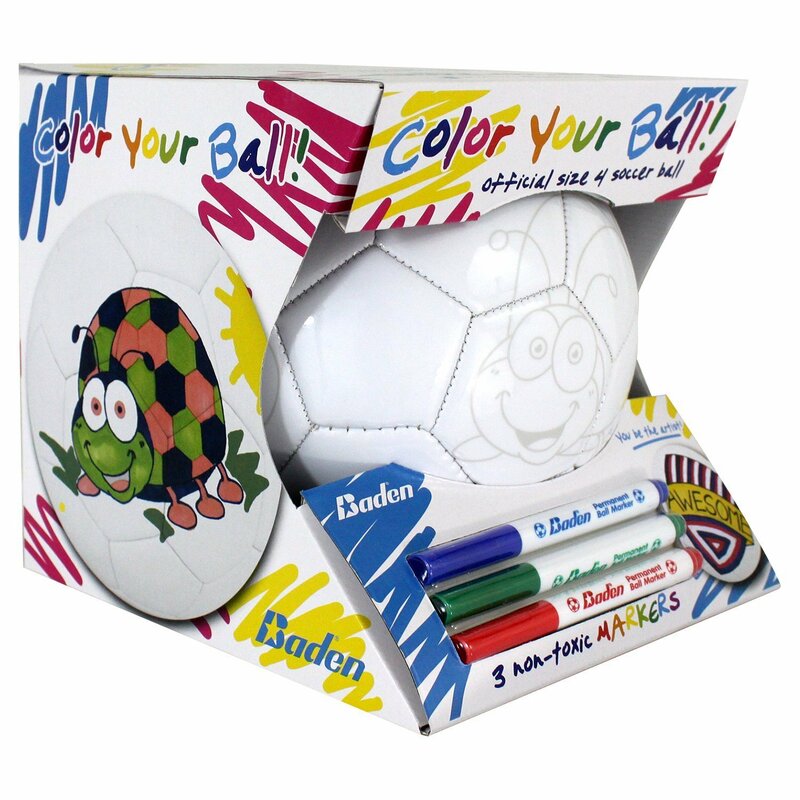 Wield the power of creativity with the Baden Sports Color Your Own Soccer Ball. Like a textured canvas, the ball is white and edged with designs to bring out the artist within your soccer player. You can color or decorate the ball as desired! Its cushioned and the synthetic construction allows for a soft feel while remaining durable for all your games. The markers are included with this amazing cool soccer ball. It also makes a fun and interactive gift for children of all ages. Look what others are saying about it “Our 6-year old grandson loves the ball he decorated. He and his older brother had a great time creating their masterpiece”. 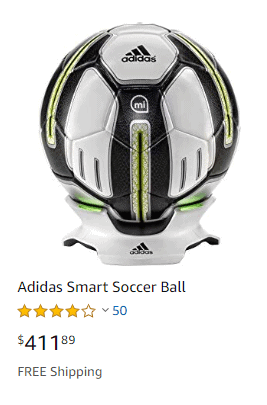 I have not purchased one of these cool soccer balls before, but I am definitely thinking about it. We think it’s probably better for kids under 10. 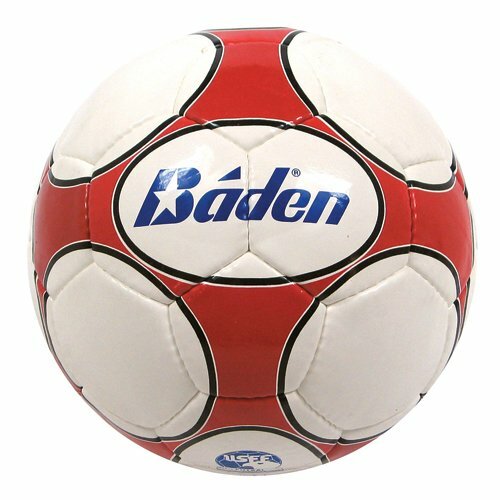 If you are looking to get your child hooked on a cool soccer ball, this Baden ball may be it! Have you seen this ball? It’s an incredible idea of a cool soccer ball that was created. This is an Ultra-durable cool soccer ball. The manufacturers claim that a single ball can outlast many traditional inflated balls. Here are some more reasons why this is a cool soccer ball. Never needs a pump and never goes flat…. even when punctured! To top it off, every time you buy one of these cool soccer balls you are supporting a play project for an organization working with youth in a disadvantaged community. How can this ball not be considered one of the coolest soccer balls of all time!! 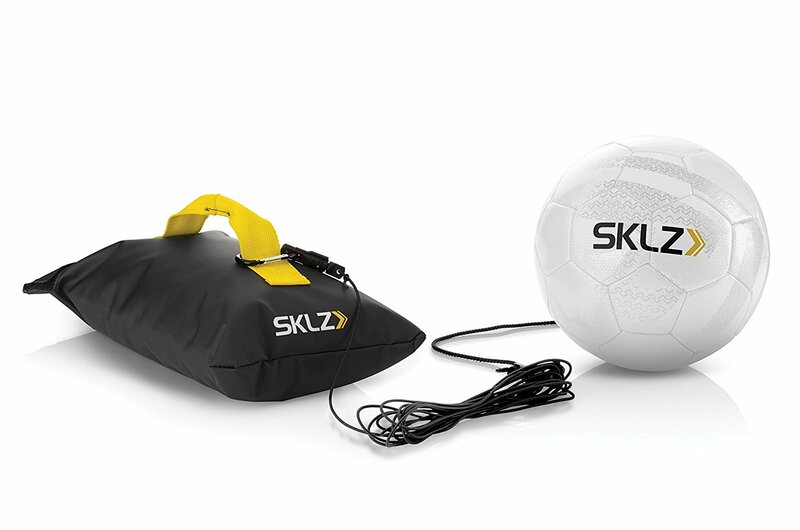 The cool ultra-durable soccer ball that plays on and on — anywhere and everywhere. 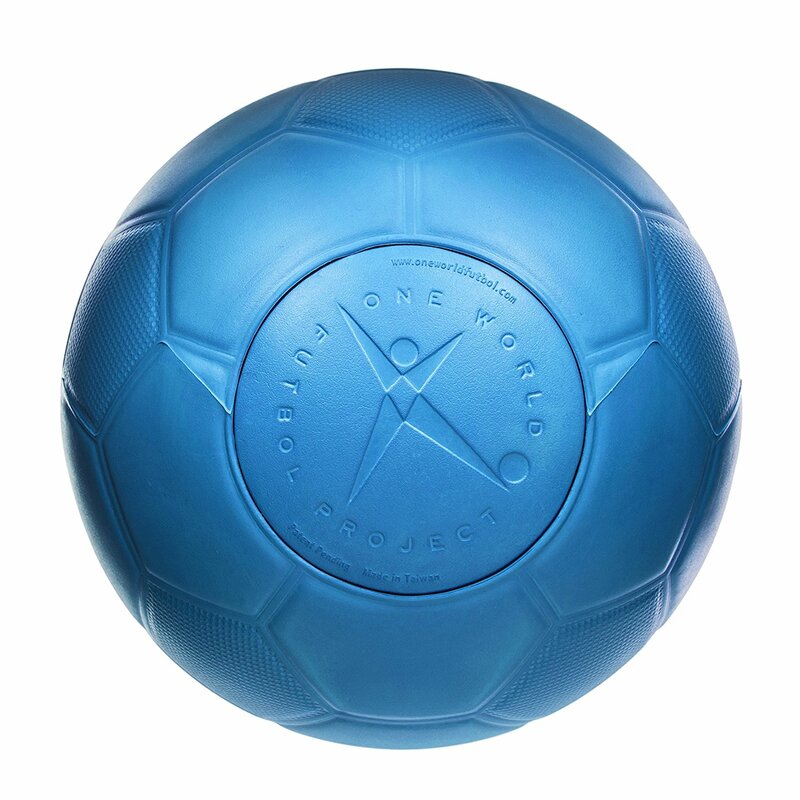 The One World Futbol ball eliminates the need for pumps and needles and the waste of worn-out or broken balls. A single One World Futbol ball can withstand the toughest environments in the world and lasts for years without maintenance, according to the manufacturer. This cool soccer ball is designed to play on hard surfaces like streets, playgrounds, blacktops, rocky landscapes and dirt lots — but it plays great on sand and turf, too. It is the perfect ball for street soccer, pick-up games, soccer practice and a great way to get out and get exercise. And then just when you think this ball doesn’t get any cooler, you find out that others are buying this cool soccer ball to play with their dog as well!! Look at what a reviewer said about this cool soccer ball, “Like some others, I didn’t buy this ball to play soccer, but to play with my dog. He goes crazy for soccer balls, and has popped/chewed/destroyed every single one he’s gotten his paws on. This is the first ball, whether made for dogs, sports, artillery, or any other purpose, that actually lives up to its indestructible claim. All of the balls we’ve tried in the pet toy aisle are either 1) made of very tough rubber or foam and last for a while, but inevitably deflate or get torn apart, or 2) made of hard plastic that my dog can’t bite into and play with”. We better stop writing about this cool little soccer ball before it gets any fancier! On to the next one. This is not necessarily a ball, but it’s an item that allows you to turn any regular soccer ball into a cool soccer ball. The Training Soccer Ball or Chord, allows you to do this by purchasing the elastic cord which is normally included and wrapping the net around the ball. I bought this when I was younger and absolutely loved it! It’s a cool soccer ball especially for kids who are motivated to train, but don’t have the space and/or friends to play with. You can work on all of your soccer skills with this ball and it always comes back to you when you kick it because the other half of the bungee chord is attached to your waist or wrist! Never have to chase down your bad shots again! Come on that alone makes this soccer invention part of the cool soccer balls list. The futsal ball may not be an exact soccer ball per se, but it looks like a soccer ball, it rolls like a soccer ball, it feels like a soccer ball, it scores goals like a soccer ball, only major difference is that a futsal ball will have less bounce. The futsal ball is a cool soccer ball because you can use it indoors and since it has less bounce, this cool soccer futsal ball won’t be breaking things in the home, or bouncing all over the walls and ceilings while playing indoors on hard surfaces. We recommend a cool futsal ball for those kids who will be using it to dribble indoors, like inside their home or inside a gym. 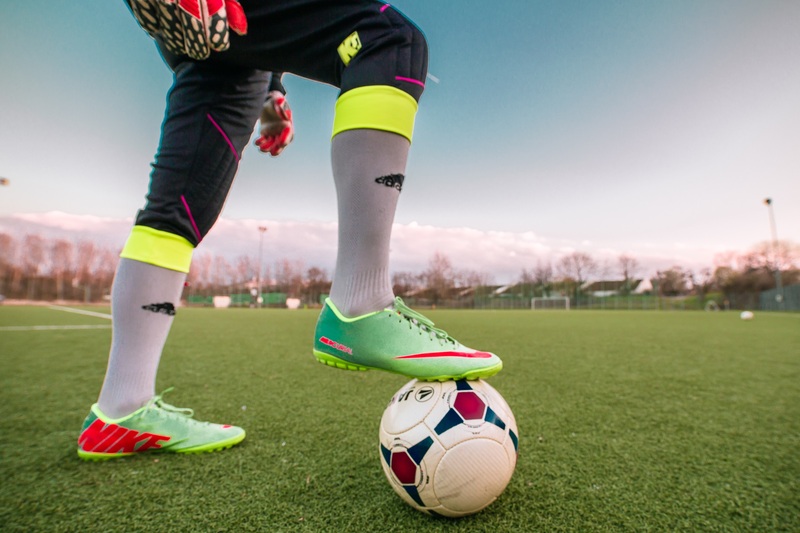 We also recommend it for those who play futsal or are training in futsal…. like the world’s best players. Because the futsal ball is so versatile and allows you to play indoors, we consider it one of several cool futsal balls..
Ok another oddly shaped soccer ball, but still a cool soccer ball. Not to mention you can fit a person inside of it. This cool soccer ball allows you to play a form of soccer, called Bumper Soccer and several other games that you can make up in your backyard or with your soccer loving friends. These cool soccer balls are made of pvc material, they are, durable,nontoxic,washable and reusable for the most part. We have used one before, but have not purchased any. 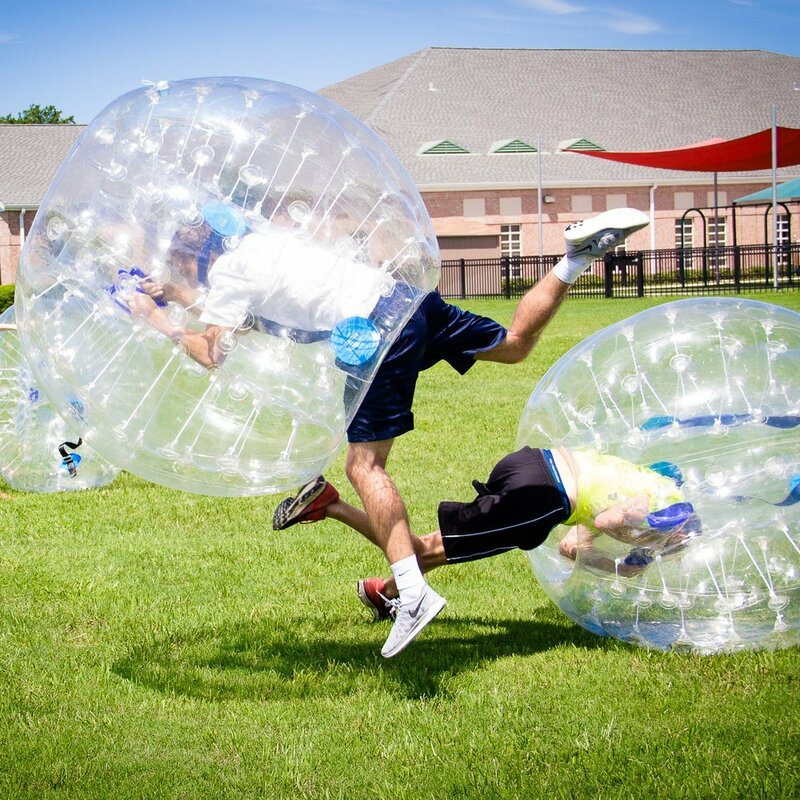 They are mostly used (and rented) for parties or even Bubble Soccer leagues, yes they exist! The Cool Bubble soccer Ball is perfect for family get together,birthday bash,end of season party,social sports gathering, bachelor party, even bachelorette party.There’s a lot of bumping, bouncing, rolling and laughing both from the spectators and the participator. You and your friends will be laughing for days after talking about the event. Did I miss any that you think are cool? I know there are many cool soccer ball designs out there, but I wanted to go with the cool soccer balls themselves and what makes them cool and unique. 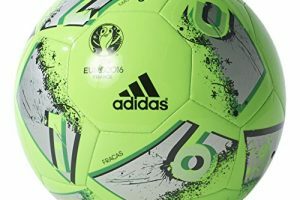 Every year Nike and Adidas come out with cool soccer balls, so I know that they are excellent, but I wanted to bring out the cool soccer ball inventions in this post as well. 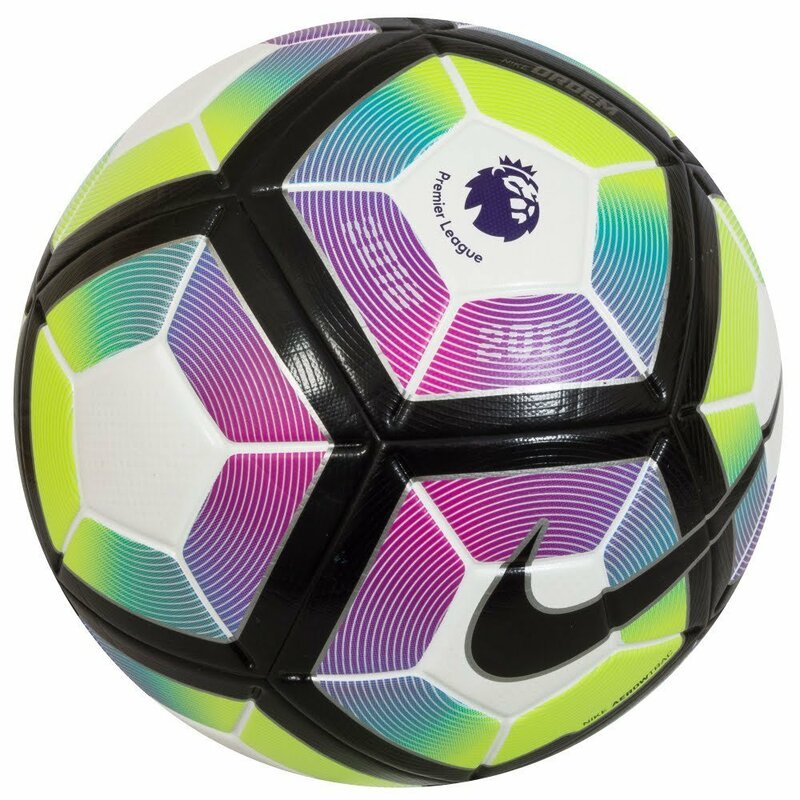 But since I have so much respect for the new soccer balls as well, here are the coolest soccer balls of 2017 as well! 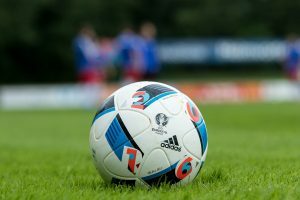 La Liga Football: Swoosh and La Liga extended their partnership until at least 2019. The new La Liga 2016/17 Ball features the LFP logo instead of the Liga BBVA logo after the Spanish bank announced that they will not remain the main sponsor for the Spanish 1st and 2nd divisions. The new Nike Ordem 4 2016-2017 La Liga Ball carries a spectacular design that draws inspiration from the colors of the Spanish flag. 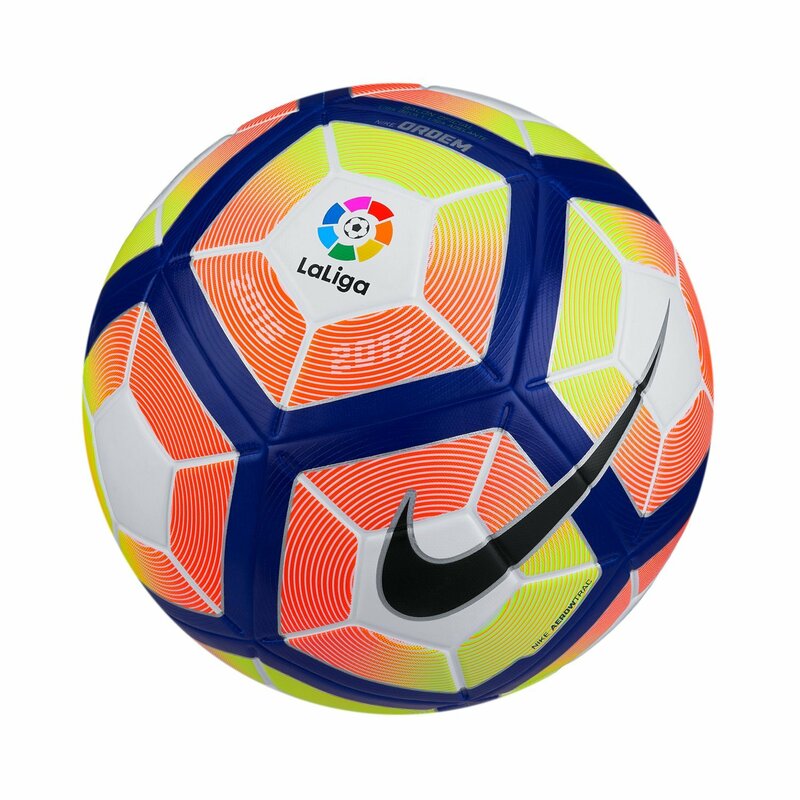 You can quickly find the official match ball for La Liga or the Spanish Football League at Amazon. 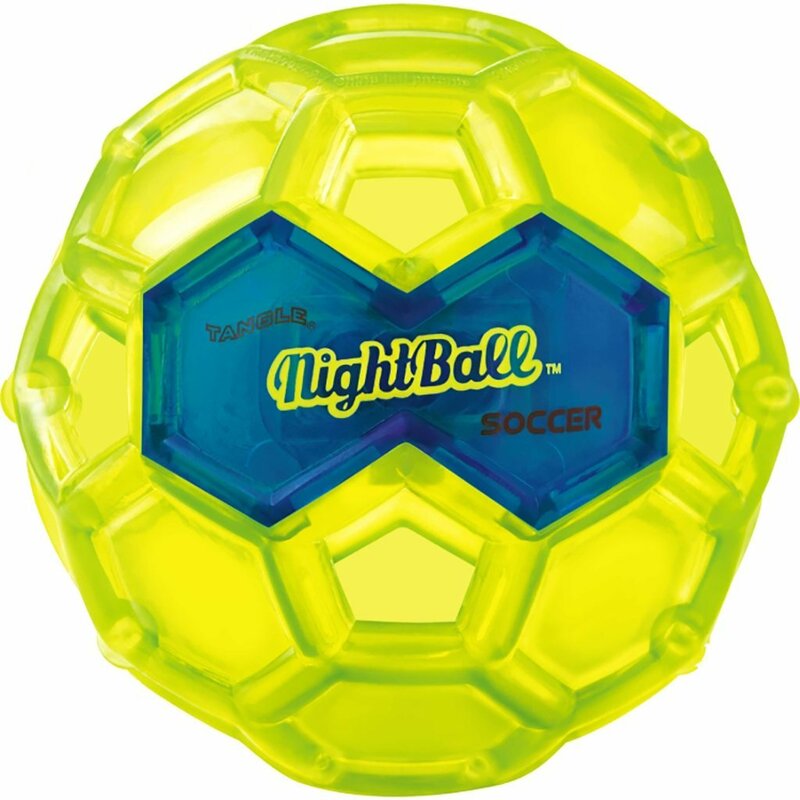 The mainly white Cool soccer ballcomes with a unique yellow and black line graphic pattern that is combined with bold blue applications to create a design that really stands out. We’ve definitely seen much of this cool soccer ball already on the pitch. The kids love the colors and many parents have purchased this cool soccer ball for their child’s training. 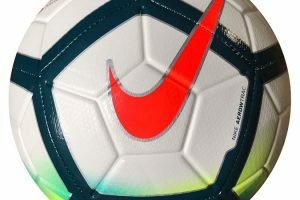 Nike is also the ball supplier for Italian Seria A and the Premier League. This is what Nike says about the Cool soccer ball the Ordem 4. 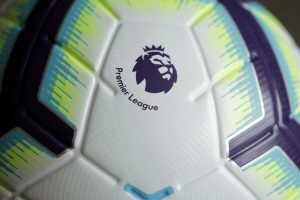 “Developed for elite footballers, the Ordem 4 has been refined around three key elements: construction, material and graphics…..the ball’s graphics follow the design principle of “Flow Motion,” applying a luminance that ensures excellent visibility while the ball is in play”. And there you have it, one of the coolest soccer balls you will see in 2017, the Nike Ordem 4.